You don't have to know much about classical music in particular to know that musicians are, as a species, a feisty bunch. This post is about a specific, esoteric, and easily-personalized debate within the classical music community. It began several decades ago, reached a climax in the early aughts, and is now beginning to settle into detente -- or rather, a "new normal." Should musicians aspire to perform the music of the past as it likely sounded at the time of its creation? This dispute hardly keeps me up at night. But all the same, it's something toward which I've devoted hours, weeks, and years of study. It's a question that informs interpretive decisions my colleagues and I make all the time. And the intensity of the debate itself has amused and fascinated me for years. Think I'm exaggerating? Here are some particularly choice words on what we now call "historically-informed performance:"
That’ll get your powdered wig in a twist. Before diving into where we stand, let's take a closer look at what the question itself really means. What is "historically-informed performance practice?" Historically-informed performance is a specialized approach toward playing music of the past. Generally speaking, all musicians aspire to bring what they feel to be a composer's truest intention to life. Where opinions diverge: how far should we go in trying? I could write — and many have done so, from Leopold Mozart to the present! — a lengthy treatise on what exactly this entails. Let's break it down concisely. the instrument itself is set up for greater tension, volume, and projection. the strings, too, are made of various metals. This results in a more brilliant, loud, and intense sound. over time, we’ve come to tune our instruments sharper and sharper for intensity. the bow is weighted such that a note can be sustained evenly throughout its duration. This also adds to the intensity of phrasing and projection. the bow is held at its absolute bottom end, which allows the player to use every last millimeter at his or her disposal. vibrato is used liberally, and almost automatically. 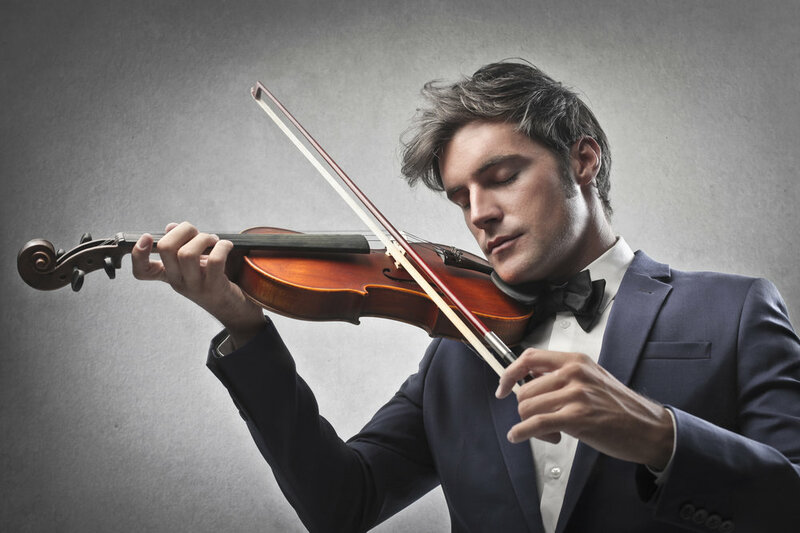 Stylistically-speaking, vibrato is now expected of a beautiful string sound. It also acts like a pump for sound, leading to — you guessed it — more volume. since composers included more and more detailed musical instructions in their scores over time, the modern style of playing is to play only what’s written on the page as faithfully as possible. as a whole, the approach towards playing is to savor every last note and moment — or die trying. This lends intensity and gravitas to the interpretation. This approach evolved naturally alongside the idea of the Artist with a Capital A.
the instrument is set up for reduced tension and volume in favor of a mellower, warmer tone. the strings are made of animal gut, which also creates a warmer, smaller sound. while there was no standard tuning hundreds of years ago, historically-informed performers tend to tune to A = 415 Hz, or a full half-step flatter than usual. This also cuts down on the brilliance of the sound. the bow weight is most comfortable in the middle third, and is therefore held “choked up” on the stick. This means longer notes have a natural bloom in the middle, and a completely sustained sound is difficult. Short strokes are much crisper, and more easily buoyant. All this allows for a “strong-weak” approach to phrasing on the micro-level that isn’t of much concern in the more evenly-sustained, modern style of playing. vibrato is used very sparingly for decoration, like sprinkles on a sundae. since early musical works rarely included hyper-detailed instructions, a lot of musical decision-making was inherently left up to the performer. This allows for plenty of creative leeway with dynamics, tempo, and even improvisation. Such improvising can be long-form (as is the case in lengthier cadenzas) or short-form (inserting trills, turns, and decorative ornaments spontaneously). The very idea of a “continuo” is that a keyboard player improvises the right hand based on what is written in the bass line. Composers of the Baroque didn’t write out every single note the keyboard player was to play. Instead, they trusted the keyboard player to fill things out in their own way given the written bass line and harmony. as a whole, the approach towards playing is to produce a warm, mellow, pure, unfussy tone, and to “let things go.” Sometimes this means playing in faster tempos, releasing notes and phrases, and experimenting with extremes in short articulations. This more humble approach comes from the recognition that early music has its roots in everyday activities like dancing, partying, and worshipping God. My favorite illustration of the difference? Check out the following 10-second video demonstration. I find this snapshot hilarious. It captures — and pokes fun at — much more than the stylistic, interpretive differences mentioned above. It winks at the heart of the debate itself. Consider their portrayals of the attitudes associated with each style of playing. The Romantic Violinist holds his violin up at a steep angle, like a primo ballerino relishing the spotlight. He moves and breathes affectedly, channeling his inner Artiste. The Baroque Violinist, on the other hand, holds both violin and bow in a hyper-exaggeration of the Purist. He’s broadcasting loud and clear that his historical integrity is what takes center stage. It turns out that the debate over historically-informed performance is essentially a moral one between self-righteous purists who see things differently. No wonder it gets musicians’ blood boiling! So… how do we play Baroque music? I’m deliberately avoiding getting into the mud ring by exploring the various criticisms each school of playing lobbies at the other — in favor of drawing a wider circle around them. We believe that both styles of playing have their merits, and are by no means mutually exclusive. Perhaps our biggest argument in favor of the modern approach: musical technology evolved, and continues to evolve, for a reason. It changes to suit changing tastes — in sound, in style, and in substance. There’s also the fact that, no matter how much research one does, one can never know with certainty what musicians sounded like several hundred years ago. No recordings exist, written descriptions vary widely, and even paintings from the time could be inaccurate portrayals. Any claims on perfect historical authenticity are flimsy anyway. What’s wrong with this picture? … Everything. But the baroque approach has so much going for it. To write it off completely would be the musical equivalent of cutting off your nose to spite your face. There is so much to be said for trying new things. For letting stylistic evolutions go in unexpected directions. For caring about authenticity, doing your homework, and letting your imagination run wild. For allowing your artistic intuition to incorporate new ideas that resonate with it. It’s for this same reason that we value the artistic flexibility inherent to, say, combining different musical styles and cultures in novel ways. Who knows whether or not Bach would have given a thumbs-up to the modern piano? Or how Vivaldi would have felt about the modern style of violin playing? My best guess is that any composer passionate about his or her art would have been fascinated by evolving musical technology. Bach would likely have been thrilled by the modern piano’s ability to play at wildly different volumes, which the harpsichord infamously cannot. (That’s why the modern piano is called the “forte-piano,” or “piano” for short. It literally mans “the loud-soft!”) Vivaldi likely would have embraced the brilliance and projective intensity of the modern violin. After all, the talented girls to whom he devoted his life were reduced to performing behind closed doors. (To do otherwise would have been “indecent” back then.) Modern setups would likely have meant their gifts would be heard better! We could talk educated guesses all day. But we can never really know what any composer from the distant past would have thought of changing musical tools and tastes. Besides, conjecture is pointless: they’re dead. It’s not like we can ask them! At the same time, we feel strongly that conjuring a different sound world to share the music of such a far-off time is beautiful, and has tremendous value. When it comes to period versus modern performance practice, Salastina’s big enough for the both of them. I’m happy to say that the classical music world as a whole has embraced much of what historically-informed performance has to offer. I love Pinchas Zukerman, and there are few people I’d rather hear play the Beethoven violin concerto. But when it comes to period performance practice, I do hope time has opened his mind.